Bon radio. 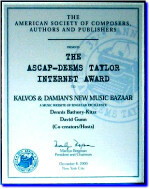 The history of Kalvos and Damian as they careen episodically through the radiophonic vagaries of the New Music Bazaar is tangentially akin to that of Cosmas and Damian, the patron saints of physicians and physicians' waiting rooms, whose feast day serendipitously occurs during this festive weekend of planetary misalignment and rice cake shuffleboard tournaments. References to the two are obscure, though we do know that they were twin brothers who lived in the late third century AD, practiced medicine without a license, and never accepted payment for their work. This last bit of economic foolishness stigmatized them as eccentric and also kept them in constant hot water with the Galen Surgical Guild, whose members relied on fixed rates for medical procedures to maintain their personal comfort zones. For example, who would want to pay two and a half goats for homeopathic vomit therapy when Cos and Dam would stick their fingers down your throat for free? The "'analgesic altruists," as they were called, gradually were shunned by their colleagues, left off the roster of intramural cadaver wrestling competitions, even their chariots were vandalized. Eventually, the hostility had nowhere to go but to their own selves, which, in the year 303, were seized and used to line the leopard cage at the Damascus Zoo. Hailing them as martyrs, their former patients turned on the Surgical Guild and angrily demanded reform, emphasizing their displeasure by organizing the first surgeon softball game, in which trussed up members of the medical community were used as both bats and balls. Improvements followed swiftly on the heels of the first inning of this first medicine ballgame, which reduced the cognitive abilities of 40% of the Guild by 50%. Doctors relearned the art of making house calls; midwives were granted access to anesthetics; laxatives became available over-the-counter; dilantin, belladonna and atropine once again found their way into the food chain; and a new health maintenance system was devised in which preventative practices were encouraged through the use of hashish, morphine and opium, or HMOs. Medical analogies between Cos and Dam and Kal and Dame are entirely appropriate. Both have a morbid curiosity for things diseased -- the sickly patients of the former versus the administrators of Public Radio of the latter. Both work for free -- though in the case of the latter pair, altruism takes a back seat to bad luck and a stingy and stodgy CPB. And both manifest a predilection for bedpans and rubber gloves that ... oh never mind. This portion of Kalvos & Damian’s New Music Bazaar, the 71st -- i.e. the Bazaar itself, not the portion thereof, of which this is the first or maybe second if you count the introductory motif -- is being brought to you in the form of an all-in-one radiophonic laxative, germicide, counteractant, vaccine and tonic for those other broadcast irritants that frequent the auditory spectrum around us. You're welcome. And now, waiting to say le flambeau oriange for a reason which shall remain couched in sofas until no longer, I give you the telecommunicable balm of Gilead, Kalvos.